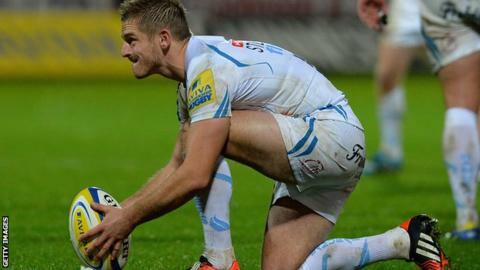 Fly-half Gareth Steenson kicked a Premiership record-equalling nine penalties as Exeter beat Saracens. Steenson slotted six kicks in the first half, with Charlie Hodgson notching two in reply. The kicking battle continued in the second period with Hodgson missing the only effort of the game after adding another two successful attempts. Steenson kicked three more penalties before Sarries added a consolation try through Maro Itoje, Hodgson converting. Exeter were hoping to consolidate their place in the top four, while Saracens were looking to avoid back-to-back defeats after going down at home against Northampton last week. Home fly-half Steenson traded two penalties with his opposite number Hodgson, before the Chiefs opened up a six-point lead, as the Irishman continued his 100% record with the boot. South African Braam van Straaten was the last player to kick nine penalties in a Premiership match, completing the feat with an immaculate display against London Irish while playing for Leeds in 2002. Steenson is only the fourth person to kick nine penalties, equalling the record set by van Straaten, former Harlequin Thierry Lacroix and Newcastle's Dave Walder. Exeter's pack was dominating the highly-rated Sarries eight, and they were unfortunate not to be awarded a penalty try late in the half after a series of close-range scrums saw visiting prop James Johnston sent to the sin bin. Skipper Dean Mumm decided to take the three points on offer, meaning Exeter headed in at half-time with a 12-point lead. Hodgson reduced the deficit as the kickers' duel continued, striking twice either side of Steenson's seventh successful attempt. While Hodgson blotted his copybook, hitting the upright with yet another shot at goal, Steenson made no mistake, restoring his side's 12-point lead. It may have been one of their backs who scored all the points, but it was the forward pack who delivered the victory on a plate. Another dominant scrum from the Chiefs forced a simple penalty award and Steenson teed up his ninth and record-levelling kick. Sarries had the last word when replacement Itoje crossed under the posts, but Hodgson's conversion signalled full-time. The Chiefs sit second in the table behind Bath, but Northampton will return to the top if they beat London Welsh on Sunday. Exeter Chiefs: Dollman; Nowell, Slade, Hill, Jess; Steenson, Chudley; Moon, Cowan-Dickie, Low; Mumm (capt), Welch; Ewers, Armand, Waldrom. Replacements: Bateman, Rimmer, Francis, Caldwell, Horstmann, Thomas, Whitten, McGuigan. Saracens: Goode; Ashton, Taylor, Wyles, Strettle; Hodgson, de Kock; Gill, George, Johnston; Hamilton, Hargreaves (capt); Fraser, Burger, Joubert. Replacements: Sharman, M. Vunipola, Figallo, Itoje, Brown, Spencer, Tompkins, Ransom.